Sammy, a 2 year old male neutered dog, was enjoying a normal afternoon playing out in his backyard. Suddenly his owners noted he completely stopped bearing weight on his right front leg, and was reluctant to move at all. On brief examination they noted a metallic foreign body protruding from his front paw. He was brought immediately to Oswego Animal Hospital for assessment and treatment. Sammy’s vitals were taken immediately. All were normal except for an elevated heart rate, which was attributable to pain. 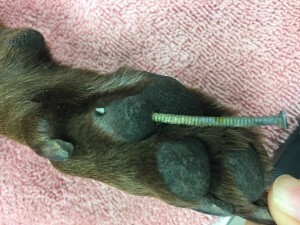 On physical examination, there was a painful, penetrating foreign body to the right front paw. The culprit was an approximately 2-inch length screw, which through and through impaled the right metacarpal pad. Care was taken to not allow Sammy to move or bear weight on his forelimb, as any uncontrolled movement of the foreign body can lead to additional tissue trauma. Sammy was sedated to allow careful and pain free extraction of the screw. Following removal, the wound tract was flushed copiously with sterile fluid to remove any debris introduced by the screw, and reduce numbers of bacteria that may have been deposited in the tissue. Sammy’s sedation was then reversed and he was sent home on broad spectrum antibiotics to prevent infection and several days of pain medication. Sammy recovered without complication from his unlikely encounter with the screw due to several important factors: 1.) location of the penetrating foreign body and 2.) time to treatment. 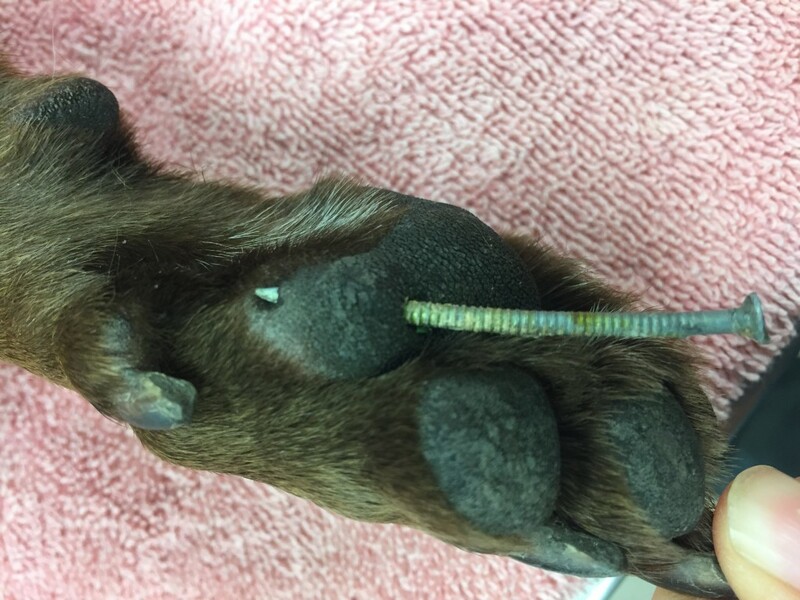 Fortunately in Sammy’s case, the screw penetrated into strictly soft tissue and avoided contact with more important structures of the forelimb, which can include large blood vessels, nerves, bones, and tendons. If his had come into contact with these structures, more aggressive surgical repair or intervention may have been warranted. 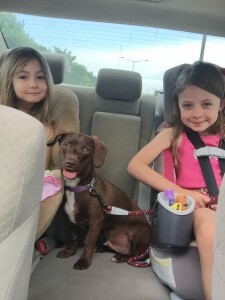 In addition to location being on his side, Sammy’s owners immediately sought medical care. For any sort of wound, whether caused by penetrating foreign bodies, trauma or bite wounds, treatment should be sought emergently. Studies have shown immediate, or in the very least timely, cleaning, debriding, and initiation of antibiotic therapy have the best rate in preventing infection. Once infection is already established, it will be much more difficult to treat with antibiotics, will require a longer treatment time, and can have serious complications including sepsis and death. Sammy today has made a full recovery and is enjoying his time with his human family. It is a mystery as to where the screw came from, but hopefully Sammy will not be on the receiving end of any further misfortunes.